Door Buddy – The Perfect Solution to Keep Your Dog (or Child) Away from Your Cat’s Space! - Petpav - Your Online Magazine for All Things Pet! Door Buddy – The Perfect Solution to Keep Your Dog (or Child) Away from Your Cat’s Space! Any pet owner who has a dog and a cat knows that (with some effort), they can become best buddies. But, the biggest struggle among our cats and dogs is to keep our dogs away from our cats’ food and litter box. And, if you have a new crawling baby or early stage toddler, there is inevitably the same problem. So, what’s a pet owner to do? Well, The Door Buddy is the perfect solution to let our cats have their own space and keep our dogs (and exploring babies) away from it! What is the Door Buddy? The Door Buddy is an adjustable door strap that mounts on your door and door frame and holds any door in your house open wide enough so your cat can get inside the room, but at the same time keep larger dogs and babies out! The Door Buddy has an easy to use hook that simply inserts into a latch that makes it super easy for adults to enter the secured room while staying intact. Door Buddy can also be used with one hand from inside or outside the room. The Door Buddy is great for cats, dogs and babies! The Door Buddy is a great way to let your cats have their litterbox, food and toys in one space or room without the worry of your dog or baby getting inside and into your cats’ food (or litter!) With a Door Buddy installed, you can have peace of mind knowing that your cat’s food and litter is being used by ONLY your cat. Sure, there are baby and pet gates. But, the Door Buddy is affordable, so easy to install, AND much more convenient especially if you are trying to block access to a room that you need to enter frequently. Door Buddy also allows for proper airflow in between rooms which might help reduce heating and cooling costs. The Door Buddy is easy to install! There are no tools required to install a Door Buddy and it takes less than a minute! Simply strap it on your door and you are good to go. Easy Breezy! Click here to Watch how easy it is to install. The Door Buddy works great on large dogs too! The Door Buddy will do a great job of keeping your large dog out of any designated room (make sure the strap is on securely). 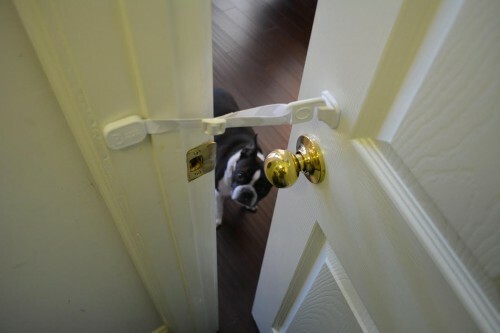 But, don’t use Door Buddy as a way to contain any aggressive pet or to separate children from animals for protection. 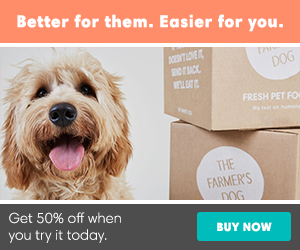 Door Buddy is generous enough to give $1 to Pet Partners for every Door Buddy that is purchased on their website. 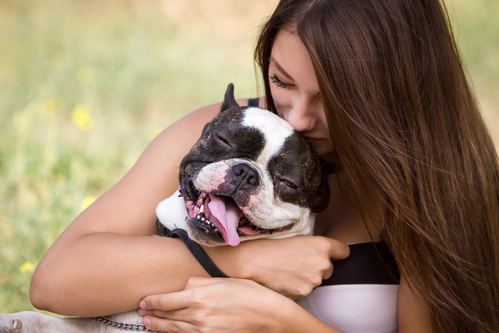 Pet Partners out of Bellevue, WA, promotes positive human-animal therapy throughout the nation by providing animal assisted interactions to a wide variety of clients including veterans with PTSD, seniors living with Alzheimer’s, patients in recovery, and children with disabilities.